Post news Report RSS	Alpha 0.5.13 released! Alpha 0.5.13 released. Important features: purchasing animals, crafter identity preservation, moveable housing, server motd, support for extendable advancement categories, more recipes, items, balancing, and bug fixes. Animals are now purchasable! The general / food vendor in BIbracte has your animal needs well taken care of. Animals are conveniently packaged in single-serving barrels that only need to be thrown to the ground to free your new pet / meal. Make sure you free them in an enclosed area, lest they run off! A crafter's identity on a unique item was sadly lost once the item was placed within the game world. Now, you can rest assured that the provenance of your items is preserved (and viewable) when the item is placed, and collected again into your inventory. Houses can now be broken down and moved, with their interior contents remaining intact! GMs can now set a server motd (message of the day) using the /motd console command. This message appears at the start of each player's session on a particular server. Advancement categories are now easily expandable by GMs / server admins. This paves the way for the new spellcasting school and weapon related advancements that are coming in the next few releases. Several new items and recipes have been added (in addition to the aforementioned barrels o' animals) which include steel plate, flat and round iron bar stock, wrought iron fencing and gate, ornate wooden gate, and hedges. Ladders, bridges, and docks also got a facelift. A new method of automatic pricing calculation based off of all of the recipe source item costs is also new. This will allow much simpler price editing, since the compounded cost of all crafted items is now calculated by the server. Feathers are now white again. Campfires can no longer be healed past their maximum durability. Fixed an issue causing an error when an action is performed with an item that has no action presence defined for that type of action. Timberframe and limestone houses are now properly defined and can have their access restriction set. Fixed an issue that was causing wonkiness when switching between advancement categories in the UI. Fixed "Lancifer's Super-Wonky-Space-Folding Pathing Bug". Thanks so much to Lancifer for initially discovering this, then spending a great deal of effort tracking down where it could occur and then making and posting videos of the bug at those locations. Fixed an issue what was allowing players to damage GM-placed keyed items. 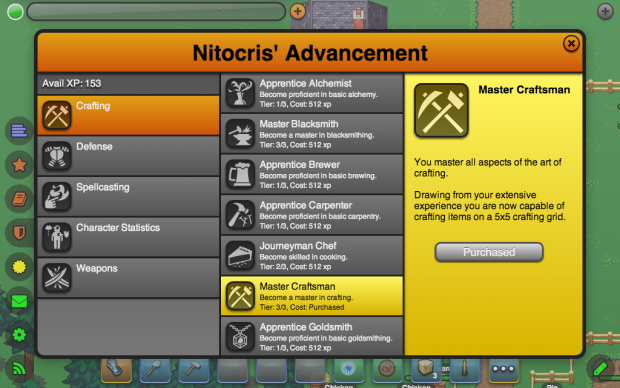 Fixed an issue causing improper crafting pattern updates. Fixed an issue with the mail dialog not correctly clearing cursor item target when closing. Fixed the infamous "character stuck in movement bug". Placed candles now have a duration of 5 minutes. After 5 minutes, they will burn out and be removed from the world. All plate armor (and the fermentation vessel) now require steel plates instead of steel bars to craft. Milk and water buckets now empty when used in crafting. 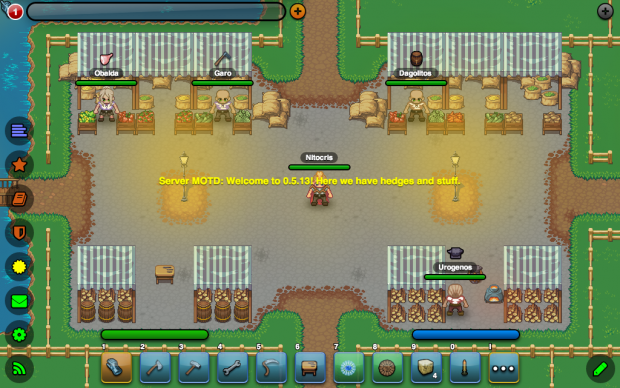 Flax seed and potato vendor slots are now on a timer. Keyboard movement implementation has changed slightly. 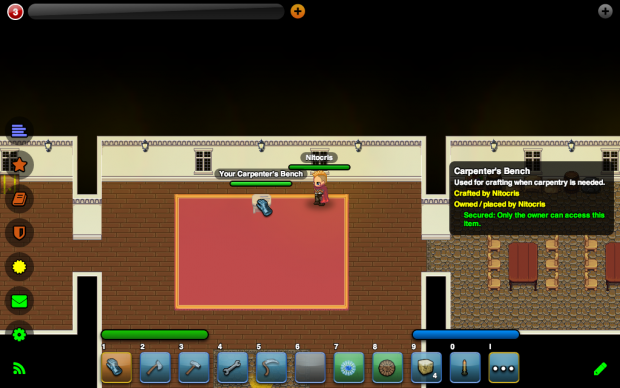 Directional movement is disabled for the time being, and the player's character will move in the direction of the last direction key pressed. This should result in smoother movement. Reduced the chance to spawn a chick by throwing an egg from 25% to 5%. Reduced the effort needed to remove containers, crafting stations, and houses by half. 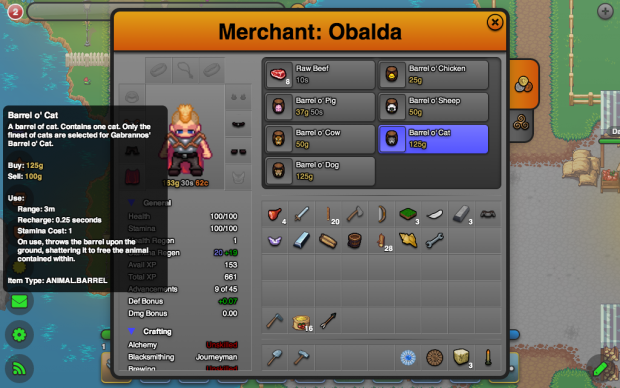 Increased range for NPC interaction (vending, quests, dialogue) to 3 tiles. Increased range for container interaction to 3 tiles. As always, the full change log for 0.5.13 is available here.